Thanks mabel.. This post is instigating me to write our Indian eating habits.. Will do it soon. Learning many things from your post. I’ve always wondered about Indian eating habits. Looking forward to that post of yours. It sounds exciting! Great post, Mabel. I’m grateful that I grew up using chopsticks and had sufficient hand strength that when I was out with friends I could cut a steak with chopsticks. These days, I like to cook with chopsticks, even something like scrambled eggs. Living alone, I confess, there are times when fingers get used more often than is proper. I would never do it in the presence of others. That impressive, Gaz, to be able to cut steak with chopsticks. It is convenient to use chopsticks. As you said, you can swirl scrambled eggs with it. You can also pick up bits of food to taste as you go. Meat on the bone is the way to go. Crispy skin on top of that meat is always a treat. I’ve just been out to dinner and you’re making me feel hungry again. Good effort. But never enough ice-cream Gaz. More. Haha, true Mabel, very true. You can make it a third before you go back. I’m an honorary Asian now. Or at least not a complete embarrassment? Oh, you’re way better than me, Mabel. I almost never use chopsticks even if I’m in Chinese restaurants – unless I’m eating a noodle dish kwan loh. I still find it hard to control it (or maybe I haven’t mastered the technique yet). I reckon the reason why we have so many dishes that are served hot (rather than cold) in Asian cuisine is because of the belief that too much cold food would wreak havoc on our digestive system. Or something along those lines. Not to mention, most Western dishes involve the use of butter in the cooking too. I’ll still order something warm/hot when I’m having a Western dish – which makes it difficult to dine in a Western restaurant/cafe cause that leaves me with the limited options of coffee, tea, or warm water. Or the occasional lemon tea. As for me, I prefer a mixture of both Asian and Western dishes. While I don’t mind the occasional consumption of steak and potatoes, I can’t foresee myself having it on a daily basis. It goes the same with stir-fried vegetables, Asian style. I actually thought you’d be more confident than me with chopsticks. Though I feel confident with chopsticks, some have remarked that I hold my chopsticks awkwardly How I hold the chopsticks feels comfortable to me, but looking closely the thumb doesn’t bend that right because of how it is shaped. There is definitely that idea floating around cold dishes make the body cold and that will make us sick – like how when the weather it’s cold we might be more prone to catching a cold. It is interesting to note butter is common in Western cooking and I read somewhere it brings out the flavour of food. Then again, butter is a kind of fat and fats are known to be tastier lol. As the saying goes, variety is the spice of life. Eating one kind of dish or cuisine can get boring after a while. Sometimes you just got to mix it up. I know my way around chopsticks to eat rice from a bowl, but using it to eat noodles from a soup dish is rather difficult. I guess I’ve been lucky that no one has commented on how I hold my chopsticks, lol. The last Western dish I had, the sauce had butter mixed with white wine. You would probably laugh, but I licked the plate clean, ahaha. Eating soup noodles with chopsticks can be so hard, agree with you on that. The noodles can easily slip between the chopsticks and back into the bowl, whether the noodles are thick or thin. ‘Eating soup noodles with chopsticks can be so hard, agree with you on that. The noodles can easily slip between the chopsticks and back into the bowl, whether the noodles are thick or thin.’ – which is why I use forks and spoons nowadays. It is more convenient and prevents the soup from spilling everywhere, aha. My campus is close to the restaurant that serves the sauce cooked in butter and white wine. It just depends if and when I want to eat there again. When I had it, I was having lunch with a friend after our tutorial. You are right. The soup can splash about if the noodles slip from the chopstick and fall back into the bowl. I’ve been guilty of that, and when my parents see they will give me a kind of rude look lol. Haha. Time to save up and treat yourself to that next amazing meal. Or see if I can drag a food companion with me as well, lol. Eating alone sometimes can be daunting…. Thank you so much for stopping by, Kurian. Lovely to see you once again. Hope all is well with you. Always a pleasure to connect, Kurian. You take care too and enjoy the weekend. The pleasure is mine, Kurian. Hello Mabel. Good to see this – saw it spuriously pop up in the feed a few days ago before it was actually published, was wondering what happened! Interesting burger picture… was that the restaurant’s attempt at east-west fusion? 1. I’m surprised that you mention spoon and fork here. In my experience Westerners almost exclusively use knife and fork for lunches and dinners (if cutlery is necessary) whereas I’m the odd one out for preferring spoon and fork – spoons are usually reserved for dessert, which I usually don’t like and therefore skip anyway. I’ve definitely grown up with spoon and fork for dinners – rice is pretty hard to eat otherwise (our rice isn’t that ‘sticky’). I also learned (but seldom use) chopsticks later. The French dining article you linked to was interesting. Some of it I don’t think is necessarily specific to French culture, there may be some overlap with high-class English/British etiquette too. Question: Was that supposed to be ‘placing cutlery upside-down’? I haven’t heard of that practice before. 2. I notice steaming and boiling a lot in Asian-style cooking. Although I’m used to a low-salt diet from Mum’s cooking, I think there tends to be less flavour in steaming vs frying or baking (the water tends to dilute the salt and flavour). Depends on the ingredients I suppose. I’m not a fan of cold/raw salads that seems to be popular in Western meals. I’m accustomed to my veggies being cooked – and cooked well at that! (Not crunchy.) Your list of popular Western dishes has made me hungry! Great pub food. 3. The round vs rectangle tables distinction may be more a practical consideration – rectangles can tessellate, so you minimise space that might otherwise be wasted with a round table configuration. (There’s also the customary ‘head of the table’ reserved for distinguished guests or family elders, etc.) But you’re right, I do notice round tends to be more common in Asian restaurants than rectangle ones, particularly for tables intended to seat larger numbers of diners (eg up to four or six may be seated at rectangle tables while round tables are reserved for 8+). In this case even round table configurations can be hard to have everyone talking to everyone else because of distance. At home with my parents, we’ve changed from rectangle (brought from UK!) to round and back to rectangle depending on whatever we had for the dining table at a given point in time. 4. Yep, noticed this one too. I eat out of shared dishes at home (and that may be more a practical concern instead of dishing out bits to everyone’s plates individually), but restaurants – especially non-Asian ones – are usually geared towards individual dishes. Eating just an entire pot of oysters is pretty silly (or dedicated) – I think individual dishes usually have enough variety within itself. Of course, the benefit with sharing plates of single foods is that everyone can try a bit of everything. 5. Always preferred focusing on mains, myself. No point having desserts for someone who lacks a sweet-tooth! I don’t mind entrée if it’s not too expensive, but I prefer to get to the ‘meat’ of the meal as soon as possible, so to speak. 6. Oh boy, the States definitely loves its super-size servings. Since I don’t eat at restaurants very often I almost always eat everything that’s served to me. It saddens me when I see people (on my table and others) not finishing their meals. Some restaurants will give unspoiled left-overs to charities like Food Bank… but I suspect most of it just gets chucked out into waste. At least Asian restaurants are often happy to offer the ‘doggy bag’ for left-overs. 7. If I understand the law correctly, Australian restaurants serving alcohol need to be licensed accordingly. Dad always used to point out to me when restaurants incorrectly stated that they were ‘licenced’. (And that’s how I picked up my annoying habit at nit-picking grammar and pointing out differences between British and American English…) I enjoy Chinese tea at Asian restaurants – in most cases it’s complimentary and I am quite surprised in cases where it is not. By law, licensed restaurants are required to offer tap water free of charge in NSW and I’m sure most other states too. 8. I don’t know that I’ve ever heard of or experienced this stereotype before. The décor might be darker in some instances but my recollection of experiences in Chinese restaurants is that they’re almost always well lit. On the other hand, I recall a few Western restaurants I’ve been to being both dark in décor and lighting, particularly at the pub end of the spectrum. I can honestly say I’ve never been anywhere with lighting suited for a ‘candlelit dinner’. I remember Mum saying she’d rather be able to see her food than have that kind of dimly-lit ambience. 9. Spice. That’s the thing that kills a lot of Asian dishes for me (and non-Asian food for that matter), I can’t handle when there’s a lot of chilli or other spices – it truly wrecks an otherwise great meal for me. With some places, even ‘mild’ stuff can be too strong for me. If one is used to eating heavily-spicy foods then I can imagine the foods Western restaurants serve would seem bland to them. But on the contrary, I find restaurant food – Western or otherwise – generally quite salty and flavourful – as I mentioned above, I’ve been brought up on a comparatively low-salt, low-sugar diet. I was aghast when I saw someone pouring salt on already-salty (to me) fish and chips or some similar meal once. Yeah, tomato sauce (sorry *cough* ‘ketchup’)… I can go just fine without sauces. But if it’s included, I will have it. 10. If I must have dessert, it’ll usually be some sort of fruit salad. Sliced rockmelon is great. (Wow, ten courses, I’ve never had that many in one go.) I can’t comment on the comparative sweetness of Asian and Western desserts. Perhaps the one Western dessert I do enjoy is apple pie or apple crumble. Plenty of sugar in that too, but at least it’s not a sickeningly-rich sweetness that’s in a lot of other desserts like cakes and puddings. Maybe it’s my weird cross-cultural upbringing but I definitely prefer Western cuisine, but Asian dishes that I’m familiar with (and actually like) I don’t mind either. But that usually falls into the category of whatever Mum has cooked and it’s definitely not Asian-Asian cuisine (as I’ve seen it from restaurants). Speaking of different phases in life, I apparently liked tofu when I was a young child. Nowadays I find it too bland, even in restaurants (except maybe the type that’s served with the meat stuffed into it). I think I’m the opposite of you, favouring Western food more in recent years than perhaps when I was younger. Heh, fish and chips for Fridays sounds great. Mum grew up in a Roman Catholic background, so even now she will often cook fish on Fridays. No chips, though. On that note about the research, I’ve also heard that we ‘eat’ first with our eyes. Likewise, smell is also very important – that’s why foods often taste bland or strange when you have a nasal-related illness. On your quote from Mr Bourdain, definitely agree that there’s something special about sharing a meal with others regardless of the context. I was going to write more on this point within the context of why some people choose to avoid certain foods but I’ll stop here lest I take up too much of your time. 😉 Thanks again for an interesting and well-written post. The burger was a soft shell crab burger. I liked it. Actually I’ve seen quite a few soft shell crab burgers around. Many of us would probably think soft shell crab has Japanese origins – after all soft shell crab sushi hand rolls seem rather popular and affordable-gourmet here in Melbourne. However, soft shell crab has been around for quite a while and probably we haven’t heard too much of it because it tends to be on the expensive side. 1. That is interesting, the knife and for combination for Western cuisine. Of the times I’ve seen that cutlery combination is usually when I’ve dined fancier. For most of my meals I don’t find myself using a knife and tend to peel apart meats with a fork. I’m sure we’ve had used plastic cutlery say when we’re eating in a food court – and I’ve found that these plastic knives never do the job and the forks do better. When I say cutlery upside down, I meant for instance putting a spoon face down as opposed to putting it the right way up – and when people place it upside down it is usually out of carelessness. 2. I also like like my vegetables well cooked and not a fan of them crunchy. When veggies are well-cooked they often soften and makes it easier to digest. Also knowing my food is well-cooked hot there’s chances of killing bad bacteria. 4+5+6. True that many restaurants have individual dishes and wouldn’t bat an eyelid if you had it all to yourself. I guess that would work well if you are dining solo in a restaurant. Or if say you really loved oysters or calamari, then a whole platter of them would be right for you. Usually I’m a savoury person but I don’t mind eating dessert as a whole meal 🙂 I do rather try to eat as much as possible and finish all the food. Not a huge fan of some places charging for a takeaway container, and taking the food home there is always the chance of it going bad later. 7+8. Yes, places in Australia need to be licensed if the are to serve alcohol, at least I think that’s the case in most states. I have also heard the offering of tap water free of charge requirement. It surprises me how much many places charge for bottled water…and it seems some of us would much rather pay for bottled water than drink tap water that is relatively safe to drink here in Australia – which I find mind-boggling. Also, sometimes the fancier the decor of a place, be it dim or bright lighting, the more high class a dining experience it might be and the more you might have to shell out for your meal. 9+10. You can just order the non-spicy dishes! They can actually be quite flavoursome. I’m not a huge chilli fan myself and do stay clear from these dishes and go for the milder ones. Some places do like to heap on the salt. It’s like how many fish and chip places, or places that serve hot chips, ask if you want chicken salt on your chips. I usually would prefer a dip over extra salt, especially if it’s made by the place. On the subject of sweetness, I do find many apple pies are either too sweet or too sour for my liking. There’s just something very nice about home-cooked food. It sounds like what you like to eat usually has some kind of connection to what you ate as a kid. Anthony Bourdain said something about home-cooked food too: that while it may be simple, but it is magical and reassuring (https://www.usmagazine.com/celebrity-news/news/anthony-bourdains-7-best-quotes-about-food/). Sounds like that was the case with home-cooked food for you. I think many of us can agree on pizza. Even if it’s not that good of a pizza, it still tastes okay. Pizza just looks good most of the time 😀 Thank you for taking the time to share, Simon. It is always much appreciated. Thought-provoking yet again. I hadn’t heard of soft-shell crab before – maybe a result of not being a seafood fan. Interesting reading about how they nab crabs just after they’ve moulted so you can enjoy the meat without the shell wrestling. I can imagine they’re more expensive because of that extra preparation effort. Put it this way: whether in a home-cooked context or at restaurants, for Western cuisine I’ve *never* seen the main cutlery be a spoon and fork. Plastic cutlery… I suppose if I eat at restaurants infrequently I have take-away lunches from food courts even less frequently than that – I usually bring my own lunch. But yes, I still know the bane that is plastic cutlery – they are almost always the flimsy type that do next to nothing when you need to cut into a nice chunk of meat. My question about the upside-down cutlery was because your original text seems to miss the word ‘down’ (typo?). Whether a Western or Asian restaurant, I’ve found veggies – if they’re cooked at all – to be on the crunchy side. Maybe rushing to cook them to churn out the food quickly for the customers. Snobbish perhaps? Or don’t want to be seen as a cheapskate? Tap water is perfectly fine in Aus – in Mauritius we would get bottled water for drinking, or rely on boiling. Even in London my parents would sometimes get bottled water because the water there is quite hard. Then again, Paris water is even harder still but I managed just fine by it while there. Sydney water is considered soft, but it seems Melbourne water is even softer than ours. That’s my point – even the ‘mild’ non-spicy dishes can be too spicy for me. I’m referring to places whose style is really dominated by spicy cooking. I never got into ‘chicken’ salt – I remember Mum would always skip the salt entirely when I was treated to a $1 cup of chips at the shops as a kid (that’s showing my age, even a small cup of chips would surely be at least a few dollars these days). But a light sprinkle of plain table salt on hot chips makes it taste even better. Just not an over-the-top heaping of the salt! Maybe I’m thinking of home-cooked apple pies – I tried the one from Macca’s once (maybe a freebie from one of their Monopoly promotions?) and while I think I enjoyed it (once I let it cool down enough), I think it was probably on the sweet side for me as well. Maybe I prefer apple crumble – the sweetness is more in the ‘crumble’ part and is balanced out by the apples. Home-cooked food is what I grew up with and dominates what I eat, even if it’s basic stuff I cobble together for myself. I’d be inclined to agree with Mr Bourdain – I probably don’t dine so much at those expensive restaurants that scramble over each other to do that intangible special ‘thing’ to distinguish themselves from the others, but a meal cooked in service of others is always special, whether at home with my parents or visiting friends. Mum has been watching a show (don’t know the name) where a family has been living week-by-week with a focus on a particular decade. Last night’s episode was on the 1980s and microwave meals had become a novelty convenience, particularly as their mum was coming back late from ‘work’ as the dad had been languishing in unemployment due to the recession. While they appreciated the convenience factor, they did note the contrast with their experience as a 2018 family where they normally eat together. You really got me wondering why soft shell crab is on the pricey side, and I think your explanation is a valid one. I’ve eaten crabs with the shell still on, and whacking them apart can actually be quite challenging – and of course a messy affair. I remember when I was traveling around Asia, in some places such as Indonesia it is a no-no to drink from the tap. Shower water in particular was considered not safe to drink as it is supposedly comes directly from a ground or well. In Malaysia it was always encouraged for us to install tap filters over the kitchen taps. It is interesting to hear in Mauritius you get bottled water. I’m not sure in Asia you’d classify the water as hard or soft – our mentality was that the water was unsafe and unhygienic to drink. Sounds like you have a bit of fondness for hot chips. Light salt over it – even a bit of chicken salt – always seems to give them a bit of a kick. Lol, and I thought I was the only one who got freebies from Maccas’ Monopoly promotions 😀 I do think their apple pie is very sweet, and the last couple of times I had time, felt sick to the stomach afterwards (but I do like the crispy our shell). Thanks for the spirited response again, Simon. I will correct that typo. That’s usually how I’ve had crab too – often at big family gatherings at a Chinese restaurant. I don’t mind the meat, but I often find working through the shell to be not quite worth effort. Indeed. I am thinking of the more ‘fancy’ dining that you referred to earlier – in that context spoons are only ever laid on the table with the intention of them to be used for desserts while the knife and fork is intended for the main course. Even fancier places (eg at wedding receptions) will have two sets of knife and fork, with one being for the entrée. Pre-packaged plastic cutlery, like on airlines or take-away lunch places will sometimes have knife/spoon/fork altogether but sometimes I find only knife and fork being offered. Of the times I’ve been at restaurants where we have doggy bags to take home left-overs, I’m pretty sure that was complimentary. $1.50 for a tub sounds pretty stingy. Maybe it’s a difference in our experiences – I doubt it’s a Sydney-Melbourne distinction. I suppose that’s another thing I/we take for granted in Australia – reliably clean drinking water straight from the tap. Thinking more about my experiences in Mauritius, I recall that in some areas the mains water is shut off or otherwise unavailable at some hours during the day. Many houses will have rainwater tanks to complement their water supply (I remember being stuck in Mauritius during Intense Tropical Cyclone Dina in January 2002 – observing the devastation the following day I saw a great many trees and water tanks toppled over). It could also be the mains water just isn’t treated that well, I don’t know. Regardless, it’s customary to buy large (eg 10+ litre) bottles of water from the local shop. Water hardness/softness relates to the mineral content of water, not its hygiene – sorry for any confusion there. It’s why I see older kettles and taps showing calcification while in London but not so in Sydney. Oh yes, I very much enjoy hot chips. Chunky chips were a treat for me as a child – the larger cut means there’s more potato and less oil from the deep frying so I understand they’re regarded as being a bit healthier – or perhaps less unhealthy – than the shoestring ‘fries’ from Macca’s. I enjoy them all, though. And I don’t see anything wrong with having the Macca’s Monopoly freebies – if they offer it, I’ll take it. As I recall, it was the one time I tried one of their chicken wraps – not too bad. Shame about your experience with the apple pie – that stomach sickening feeling is what I get from rich cakes, that’s why I don’t have them. In spite of our selfish tendencies we were made to serve each other, and being able to share food together is something particularly special. I suppose it’s a unifying common denominator – everyone has to eat at some point – plus it’s a time of community. I’m not much of a cook, but I loved being able to cook pancakes and bacon and eggs for the indigenous kids while on Dusty Boots. I’m also not much of a morning person but I try to stay on Eastern Time which is two hours ahead of WA, so I’m often up early to help with the breakfasts there. Hmm, maybe. I remember Mum likes watching a lot of (traditional) cooking shows, with chefs like the animated Ainsley Harriottt, Nigella Lawson, Jamie Oliver (back when he was still the Naked Chef, before he got really famous), Gordon ‘I-need-to-swear-at-everyone’ Ramsay, Rick ‘I-can’t-shut-up-about-Padstow’ Stein, and Kylie Kwong. I was fortunate that, unlike a lot of mothers these days, Mum stopped work after having me so she always cooked for the family. I don’t think I knew what a ‘TV dinner’ was until I read Roald Dahl’s Matilda. At fancy restaurants there tends to be servers taking away cutlery when you are done with one course, which I’m sure you’re aware of. It’s not something I’m used to because from a practical perspective that means more washing up to do. Then again, using real cutlery beats using pre-packaged plastic cutlery. It sounds like there is water rationing in Mauritius, the water being shut off for part of the day. That was how I grew up in Malaysia: there were days where my neighbourhood would have no water and the water trucks would come by, and my family and I went out with buckets to collect water for overnight use – including showering, cooking, cleaning and flushing the toilet. Water isn’t treated too well in Malaysia, and also water pipes are known to rust. The cyclone you experienced sounded devastating. The cyclone might have driven up water levels but still, it probably wasn’t drinkable or usable. It is very nice of you to get up and cook breakfast while visiting the Indigenous community. They must appreciate it so much. You are right. Everyone has to eat at some point, that is simply how we live and so keep connecting with each other. There’s also a unique taste when something is made especially for you, cooked at home. It’s a taste in your mouth that is hard to describe. Yes, such a lavish lifestyle isn’t one that’s appealing to me generally since as you point out it’s rather wasteful (I’m fine with reusing the cutlery from entrées but I understand a luxury restaurant wants to present the best experience for the customer). But I accept it’s appropriate in some special occasions, and metal beats plastic in the cutlery department for sure! After a bit of research it looks like you’re right – the water infrastructure in Mauritius is badly aged and apparently up to half (!) of the water is lost through cracks in the pipes. On a positive note, however, as of 2012 the water quality in Mauritius is supposed meet the World Health Organisation standards so that’s another something new I learned. Maybe buying bottled water is just a habit that once you’ve grown up with, you don’t really stop. I haven’t been back since 2012 anyway. I admit it was the first and only time I’ve endured such intense cyclonic weather so it was a little scary when the worst hit at night – I wasn’t in fear for my life but the noise of the storm and things crashing, etc, was startling. Our flight landed during the day and was subsequently grounded as the cyclone intensity was upgraded from category 3 to 4 – we were stopping at Mauritius anyway. Even for a country that’s accustomed to cyclones I think Dina was one of the worst ones. Oh, I’m not the only one cooking! But flipping bacon and eggs on the BBQ plate (we use BBQ trailers for cooking on our travels) is relatively easy and even something that I can do, so I’ll take that job no worries. All this talk of fancy restaurants and cutlery got me thinking about cutlery and the patterns over them. Growing up I noticed my parents really liked looking at cutlery in the shops – not the cheap ones but think of heavy porcelain plates with flowery designs and come in sets. Never understood their obsession but now as an adult and having dined a fair few places, it is nice to eat from a plate that has a bit of weight. It is interesting to hear that water is lost through pipes in Mauritius. Makes me think if that’s the case in some of the countries I’ve visited. When there are cracks, there’s always potential for rust but good to hear water standards that are on par. Oh, if we’re talking about porcelain handles on cutlery that’s really fancy! Is there any such thing as a luxury set of chopsticks or are they really just a practical implement? I’ve seen some nice ones but they are still made of wood. I suppose less advanced countries will have older infrastructure that breaks down over time like that. It was very nice, I’d love to revisit it. It’s not uncommon to find stainless steel chopsticks for Korean cuisine. If you want luxury chopsticks, how about try chopsticks made of real gold. Had two meals out yesterday (unusual for me) that’s pertinent to this discussion. Had a team lunch for work at a Thai restaurant (still a bit spicy!) that served with a single set of spoon and fork. Then had dinner at a Greek restaurant with my church group, two sets of knife and fork, with spoons only being brought out for certain orders that suited them. I like both Chinese and Western food. And with Western I mean mostly Spanish, haha, which is very different from the idea of “Western food” that Chinese people have (it seems many people here base their knowledge of Western food on American movies and think all foreigners live basically on beef and milk. Traditional Spanish food is varied and healthy.) We cook both Chinese and Spanish food at home, but our Chinese food is not as “flavourful” as the usual Chinese food as we don’t use MSG and put very little salt and soy sauce. When my MIL cooks I find everything too salty for my taste! I also don’t like frying things (the other day, the cleaning lady that comes to our apartment once a week mentioned that when my MIL comes and cooks she has to clean the smoke extractor because it is full of oil, but when I cook it is completely clean, hahaha) and I prefer steaming. I always use chopsticks when eating Chinese and fork and knife when eating Western. Eating Chinese food with fork and knife feels weird and even difficult! I like to fold my pizza slices in half so that I can stuff them in my mouth just that much faster. I will accept that challenge … ordering one Chicago-style “deep dish” Sicilian. Whenever I read about most things Australian on your blog, I think of British culture on which a lot of it was based – there are so many similarities. So the perception of blandness or so many similarities to each other in Australian dishes doesn’t surprise me. I don’t know about it there, but in Britain (particularly England which is where I’m original from, though I moved to Wales some years ago) our food was affected very badly by WW2’s food rationing and probably wasn’t wildly imaginitive before. What changed things here was getting what a lot of us still refer to as ‘exotic’ foods that we didn’t have or rarely had access to in the 1950s and 1960s, such as the normal dietary foods of countries such as India andother hot-climate countries. I,personally, wasn’t brought up on most of the traditional British fare, nor on quite a lot of the fast-food that came later. Despite the fact that the internet wasn’t in existence then, my mother managed to collect loads of recipes from all over the world, usually published in magazines and newspapers, and she was very experimental. Some time in the 60s or 70s when I still lived at home, a Chinese friend of my parents (she was a painter of beautiful watercolours and gouaches) taught me how to use chopsticks and for a while I ate with little else, having bought myself two pairs of wooden ones. My parents would use normal European cutlery – knives, forks, spoons, and I’d be at the same table eating with chopsticks. I enjoyed it (it’s probably psychological but I think food tastes different eaten with different utensils, like how tea and coffee taste different when drunk from a cup or mug). I haven’t used chopsticks in years and am not sure how well I’d manage now as my hand/finger/thumb coordination aren’t very good anymore (when I do my colouring I use a mouse rather than a stylus and mostly move the mouse using my arm than wrist), but I just picked up two biros and tried, and as I suspected, I can’t keep the lower one stable enough and get the upper one in line with it. I’m curious – are the left-handed and right-handed chopstick users? Australia was colonised by the British in the 1700s and 1800s, and their presence probably had an impact on food back then which we still eat today. So it’s probably why you are noticing similarities between Australian and British food. Interesting to hear of food rationing during WW2 and eating flavourful food might have been a luxury back then. 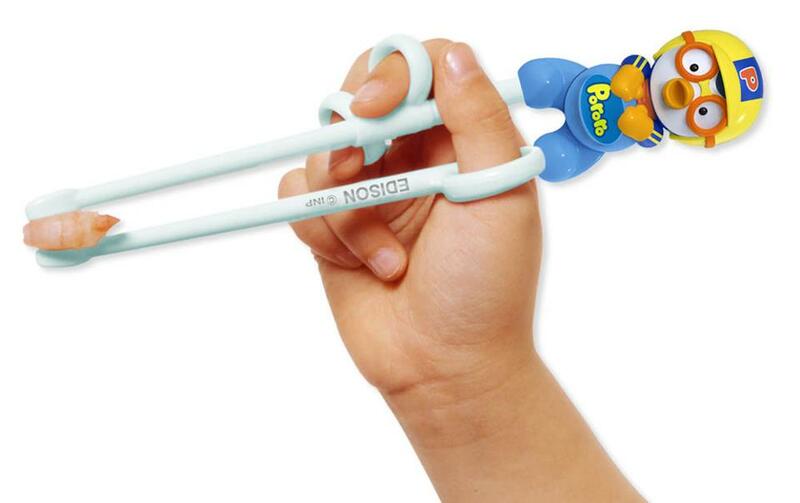 They are good for practicing how to hold chopsticks. But your experience with chopsticks does bring an idea to mind: maybe as get older we lose coordination and strength, and maybe chopsticks can be a harder to hold and use. Yes, it’s early British colonisation that will have done it in Australia. I wonder how different it is for the indigenous, Aboriginal culture versus the incoming ‘new’ Australians? Have you looked into their dietary culture? Rationing finished while I was still a small child – several years after WW2 ended, though I was too young to remember it, but I do recall how awfully dull traditional English food was in those early years. One of the things they’d had to eat (at least people who didn’t keep chickens, so most city dwellers) was powdered egg, so I would think that when fresh eggs were available again they probably continued to do what they’d done to try to perk up the previous versions of it. Maybe that’s where adding sauce to everything originated? (I don’t know this for sure, would have to look it up). Powdered egg sounds rather preserved. But if it was sustenance back then, then it must have been and kept one going. Sauces are usually easy to store and last a while, so maybe sauces were popular during that era too. Personally I am not a huge fan of sauces and like them with food sparingly. That should have been are ‘there’ left-handed and right-handed chopstick users? Sorry… I seem to be in a typo day! The answer is yes, I love to eat both. You said that Asian desserts seem to taste sweeter and I found that interesting since I would have said the opposite. I really had to think if Asian desserts or Western desserts taste sweeter. I said Asian because almost every Asian dessert I can think of is sweet, whereas you can have sour Apple pie and lemon cakes for dessert. That’s true. When we lived in South Korea we enjoyed getting desserts from a local bakery, it just seemed to us that they had several options without complete sugar overload 🙂 Also, it seemed that icing was used with more moderation. Sounds like you ate a variety of foods in South Korea. I think South Korea and Japan are two countries that take a lot of pride in their food, making it as nutritious as possible. Mabel, you come up with such interesting posts. My guess is you are a keen observer. You are right. The key differences between western and Asian style of eating is using hand rather than forks/spoon, community/family eating and extensive use of spices and condiments. Chinese food might exception in the last case but the one is Thailand, India, Sri Lanka etc. do use lot of spices. Also Asian food stress a lot on freshness and wholesomeness. At the same time, the way societies are merging with everyone trying to eat a variety of food and experiment, I hope the benefits of Asian eating benefits western people too. You are spot on, Arv. I actually like observing a lot. My experience with Indian food (curry, dhal, bread) has always been bold – from the first bite I can always smell and taste the spices and usually it is always too spicy for me. So true that Asian food is about freshness and wholesomeness, and there is so much pride in framing and harvesting in many parts of Asia. I am a definite chopsticks user if I’m eating rice or noodles. I even use them out of habit for other foods, like if I’m eating fried eggs or bacon. I cannot stand it when people slurp up their noodles even though it’s common. Sticking chopsticks upright in rice was and still considered rude because, as I was always told by my mom, that sort of thing is only done when paying tribute to a deceased relative and to do it in any other situation is disrespectful. Some chopstick etiquette I find be too old-fashioned though. Like at the dinner table, my mom once rebuked me for using my chopsticks to move a piece of meat to get a vegetable under it. It’s not like I used my chopsticks to flip through the whole dish. I’ve never really dealt with the seating arrangement thing except for some reason, whenever I eat out with my parents, they insist I sit in the inner most seat. I’m not sure if that has anything to do with seating etiquette. Eating till full has been my general experience with elders in Chinese culture, though I never enjoyed people’s insistence I eat more if they thought I didn’t eat enough. Both my parents also seem to have a strange aversion to leaving leftovers for a meal and prefer it if all the dishes are finished. I just don’t understand it because that sort of thing is not humanely possible for everyone to finish everything. It was a lot of pressure to conform and be agreeable. I stopped complying with that for my own health and wellness. I also cannot stand it when people slurp noodles. It may be respectful in some cultures but to me it’s a sound I don’t want to hear. Not sure if your parents slurped their noodles, but mine do and they highly encourage it. I also was taught not to use chopsticks to dig around food served in the middle of the table, and instead to use a common serving spoon, and this was a for hygiene sake. But many times I forgot and just used my chopstick to pick up the nearest piece of food to eat. My parents always ask me to sit in the innermost seat too! For instance if we go to a Chinese restaurants and get a table along the wall, I am always asked to sit right next to the wall or corner, and it’s usually oily or grimy/ Not a huge fan D: Seating on the outside or the aisle seat, you’d sort of feel like you have more room to move and also the power or more opportunity to hail the service person and order food. You are so right in that it’s not always possible to finish all the food on the table. My family is also that way, preferring if all dishes were finished. If we’re eating at a restaurant and there was a half-finished dish, they’d leave it. However, they don’t like to throw out home cooked food and don’t mind having it as leftovers the next day. My parents do slurp their noodles. It’s irritating. I find it quite noisy hearing them eat noodles at the same time. Yes, the innermost seat is always near the grimey wall! Ugh. I don’t mind the innermost seat most of the time because sitting at the outermost seat makes me feel vulnerable and exposed. It’s good that your family doesn’t mind leaving behind unfinished food at the restaurant. My parents, on the other hand, still expect in that situation for all the food to be eaten or taken home as leftovers. 😑 Worst of all is when my dad feels the need to finish leftovers when no one else will. This is what I mean by the obsession with not wanting any unfinished food. And I hate the phrase, “If you don’t finish it today, it won’t taste good tomorrow” as if that is supposed to motivate me to eat it when I’ve already had enough. Lol definitely agree with sitting on the outside being more exposed. I’d rather be exposed than be cramped and dirty haha. Forcing oneself to finish the food on the table when you are already full ain’t always that good for your health. If you’ve had enough, you’ve had enough because overeating can be a dangerous thing, leading to weight gain and future ailments. Hmmm, I probably eat more western food but I like both types! But my western food is not British in origin (as someone else noted is often the case in Australia); I find all that fried, bland food almost tasteless. But I love salads, which were awfully tough to find in some of the Asian countries I’ve visited, and simple grilled proteins like tofu and occasionally seafood or fish. When I got home from three weeks in China, I thought I’d crave a yummy pizza (perhaps my all-time favorite food), but no – I made my family go out for dumplings and more Chinese food! I guess it all depends on my mood. (As a side note, in our house we rarely use spoons except to serve food; knives and forks are used at almost every meal.) Fun comparisons in your post! This was fun to read. I love both, but I do love Asian foods because I grew up eating Asian food and am used to cooking in that sort of style eg. steaming, boiling vegetables, eating with chopsticks and often out of habit a lot of my meals have rice or noodles. Perhaps it’s the familiarity and flavours that I like, but at the same time I do like eating Western foods too! When we taste familiar flavours we often feel a sense of comfort. It’s interesting how some of us can grow up in a Western society and yet predominantly eat Asian food. Our cultural upbringing can have a strong influence on that. You hit this one from all its angles too, M. The cultural differences struck me one day over 20 yrs ago when I took some American colleagues out to a Korean restrnt in PA. My friend pulled back from reaching in to share the side dishes because, I learned, that would be an unsanitary breach of etiquette and protocol. And hey, that bowl of ramen looks good! I hope your American colleagues enjoyed the meal at the Korean restaurant. It sounded like a different experience for them. Made that bowl of ramen in under five minutes. I’ve eaten that brand of ramen for all my life and it’s comfort food to me. It is interesting to know more about Eastern and Western eating habits and your post is quite comprehensive Mabel. While eating with fork and knife came from the west but has found a convenient place at the tables of urban eastern families since British have left many of their traditions behind at a number of places. I think eating with chopsticks is the most original way of eating, very fascinating too for those who have never tried to learn it! Individualistic culture of the west reflects in their way of eating too! The east believes in sharing all the dishes, offers variety while eating one meal and helping oneself with whatever portion one needs, preventing any wastage. I am sure you don’t know the ancient tradition of serving the dessert before the main course and is still prevalent in many parts of Indian states. Spices and curries are an integral part of eastern cuisine. Flavors form the basis of Asian food. Many Chinese and Indian dishes are too hot to eat and we have to say while placing an order that we prefer less chilly food. These days so many of us are indeed with using fork, spoon and knife for dining. Maybe that is the easiest way to learn how to eat. Maybe it is a tradition left behind by the British from colonial times as you suggested. Holding and using chopsticks can be hard in that they can easily slip between your fingers, but with practice it should come naturally. I have heard of desserts being eaten together with the the main course – and that many of Asian background have no trouble eating something very sweet and savoury at the same time. Fascinating to hear that in some Indian states it is served before the main course. A sweet treat up first before the hot foods. I really do prefer both. I feel lucky in that regard because there are plenty of expats in Asia who crave “their food” especially in order to feel full. And Western food is typically more expensive here. When I think about cooking back in the States, trying some Asian dishes, I think about how we didn’t always have the right spices – or herbs – or if we did then it might still taste different. So much of cooking is based on weather, climate, and what’s around! In Thailand, the food tends to get spicier the hotter the weather is! So down South the dishes are more spicy than in the North. What I like though is the influences different cultures have on local cuisine. For example, up here in Northern Thailand we have a Burmese influence, and in the East, a Laos influence. And now that I think about it, I’m sure food gets more Malay the further South you go. Or if we head Stateside, the South comes to mind – lots of creole French influences in someplace like New Orleans. And Tex-Mex flavors in – Texas and the American SW.
We have both always loved Asian food (Japanese, Chinese, Vietnamese, Thai) and have searched it out no matter where we have been in the US in the past where we lived for numerous years. One of our particular favorites has always been dim sum and no matter where in the world we are, we will look for it and eat there if at all possible. In fact, our first country in Asia that we spent time in was Viet Nam and our motivation was purely initially all about the food. Your post is extremely thorough ( as usual) and very interesting. While reading about the utensil section, we had to chuckle as living in Sri Lanka, curry and rice and everything else, is always eaten without utensils. The curry and rice is squeezed together into loose balls, after being moved around on the plate quite significantly before consumption. It is definitely a case of adding the sense of touch to the meal. It is always interesting to read about your childhood stories of time in different countries and cultures. Sounds like you know where to get delicious Asian food wherever you travel in Asia. I remember reading your Kuala Lumpur post a while back and you had some great dim sum while wandering the city streets. That’s the amazing things about food in Asia – you don’t have to dine high class to get delicious food cooked with passion. So insightful to read about how food is eaten in Sri Lanka. Sounds like a very minimal eating experience, so different from the Western world where if you pick up food with your hands, you might get stared at. Thanks for stopping by, Ben and Peta. Keep travelling and hope to read more of your adventures soon. Interestingly, drinks are not usually a part of Indian meals, except for water. I like to keep water ready while eating because I usually get hiccups because I often eat too fast and swallow without chewing. We do have a range of home-made drinks which are curd based or fruit based, like green mango and spice based which aid digestion. But they are usually served before (as an appetizer) or after meals (for digestion) but I am not too fond of liquids unless it is really very very hot. Thanks for a fun post and have a wonderful weekend Mabel. Burger! Did you have to mention it? And this is a weekend…ah well I live in hope 😉 The drinks are delicious but dont like them with meals. Comedian!!! 🤡🤡🤡🤡 I got drained after a marathon pen of a 3 part which turned out to be 6 parts series – but I had a blast playing the fool and like you say comedian. Perhaps someday if you are at a loose end and armed with burger and fries…. Maybe a burger and a fruit salad sundae on this hot summer day🤔 what say? I guess I am an exception when it comes to few of those points. When it comes to Asian food, my only wish is we don’t spend a lot of time occupying the microwave in the office. Sometimes, I just had to go back to my seat after waiting a few minutes in the queue. So interesting to hear you rather not share food and prefer to eat quietly. You know what, I like to eat quietly too and don’t mind eating alone. But when I want to try multiple dishes, might have to rethink eating quietly lol. I enjoy Asian meals more than Western one despite being Euro-American. The sauces usually agree more with my digestive system and I don’t fill stuffed afterward. However, I can’t get the hang of the chopsticks. I must have a fork. Interesting Mabel. Personally I love all cuisines, the spicier the better! Western food is a bit bland compared with some of the interesting Asian dishes. We loved experimenting in our trips to China and SE Asia as well as Australia. I also live curries in Thai and Indian foods. And don’t get me started on fresh Naan!!! Darn, now I’m hungry!!! Never knew you were into spicy, Tina. It sounds like your spicy tolerance levels are higher than mine lol. Naan is amazing, especially with a strong and flavourful dose of garlic. Hope you get to eat some delicious Asian dishes sometime soon! It’s my pleasure to visit with you, Mabel. I always learn something new. Do you know Mabel what I find in Asian restaurant that is not exactly my liking? The ambience is not there. Food might be good and some are original to their traditions, meaning not adapted to American palates, like most ethnic restaurants are, but ambience is really what I want to see. I think you are right on ambience. Some Asian restaurants seem like dens that don’t look inviting – dim, dark, dank, colourless and lifeless walls. The higher end Asian restaurants tend to have more decor which can be really lovely. Here in California, Asian restaurants are really for in and out affairs, a quick lunch, inexpensive and filling. Maybe that’s the reason for lacking ambience. Maybe in the future there will be different kinds of Asian restaurants, less takeaway and quick-and-easy joints. As the world is so diverse, maybe it is just a matter of time. Mabel, only one time I went to a traditional Japanese restaurant in my area with a couple of friends. We really meant to have an exceptional experience, The atmosphere was cozy, we sat on tatami with shoes off. When we got up, we almost fell backward, the price was so high….we will remember that dinner…. Dear Mabel this is a sumptuous post and such range of delectable cuisines at dazzling display, food connoisseur like me is in a state of joy. I need to quickly venture into food paradise. The thought of food makes most of us very happy and there is such deep connection between the food with the state of happiness, the culture and the community that build around the types and habits of food. Everything it seems is centered around food. There are many who enjoy the very experience of cooking and eating, and it is indeed an art more than the science that goes into making food palatable, nutritious and healthy. This very idea of yours on how two different set of community look at food, and how has food evolved differently between the eastern and western culture…is fascinating So much is hidden in the diverse culture that reflects in the food we eat and how food has a deep connect with the life we live and changing lifestyle. I agree the ingredients that goes into making a dish and the fundamental difference of boiling and frying, Chinese food has that soft inclination towards boiling and the Indian food has that deep inclination towards frying. The question of fast food to food with elaborate arrangement that goes with the Indian food habits and if you are in the South of India, the jigsaw puzzle of combining the plethora of dishes on a plate called Thali, will keep you wandering and by the time you solve the puzzle your hunger is gone. But with the Indians loving the South Indian Thali, the quantity and variety makes the taste buds on fire. In certain part of South India, if the food doesn’t literally put your tongue on fire the food fails the test of taste. I agree, it is not just the food but the way we sit and eat, and how we make the eating place a meeting place and conversation occasion. Today with the digital distraction and mobile snatching our face to face meeting, this is the only place we are perhaps left with little space to connect and communicate. Yes the type of table we use and the way we eat and using the forks to finger has its own advantage and ultimately what matters what we eat and how we are ensuing that it undergoes perfect digestion and the energy it produces. There are these residues called fat that comes with eating and excess calories staying within our body is not good…healthy eating and wellness so vital to a happy and long life. Along with food the food for thought that matters more today than it was perhaps few decade or century back. Lovely post Mabel and with so much insights, and it will be a wonderful conversation. You are spot on. The thought of food makes many of us very happy and eating food also makes many of us very happy, maybe even happier. Culture and community are certainly are part of every dish, from its conception to its creation and to serving and then consumption. Again you are spot on when you say cooking and eating is an art and science. There needs to be balance of not only ingredients but the thought of crafting that dish that makes it enticing to eat and share. The world is changing, and so food is changing too. It is interesting to hear that Indian food has a deep inclination towards frying. Growing up the Indian foods I was familiar with were naan and curries, and samosas! Never tried much fried Indian food but I take your word for it there are many fried Indian dishes and they taste amazing, albeit best to eat in moderation like any other food. I Googled Thali. Thali seems like a meal with many dishes and there is a variety of dishes, variety of nutrients. Would love to try it some day. These days it is so common to see many eating and looking at their phones at the same time or watching TV. We might be distracted with our screens and then eat excess – which then as you said excess calories stay in our bodies. There is so much to eating, from cooking to serving to eating itself to digestion and the way we share food. So much food for thought there. Yes Mabel as so right put it is the saga of conception to creation to consumption…food has its own set of stories and it is just not the thing we merely eat, it is about the things that come along with it…the conversation, the presentation and the composition of the food. Food is the driving force in life and for a moment if we imagine there is no need of food for us to live life and then food loses it vitality and when we are forced to eat bland food either on health ground or lack of options, we will give a different glance at food and so much paraphernalia won’t be there around the place of cooking and eating. When we talk of culture, food occupies an elevated position in the comparison chart of so many things and the food habits has its history and the reasons why we cook and eat the way we do in certain community and the culture and belief has its strong bearing on the spread of food. Indeed with time things change and food is no exception and new things get added and many things gets pushed to the back burner. Though calorie and taste that predominantly drives the type and quantity of food we consume and with easy availability and the concept of fast food has made us lazy and our working has made us crazy and we grab whatever comes our way and eating has become a mechanical process whereas eating should be one of the most important activity in our life where we should be giving the due focus…unfortunately digital engagement has de-focused it. Yes dear Mabel always always a great pleasure having our conversation, agree though bit late now a days but quality remains on the top. Food is the spice of life. There’s the saying which I am sure your philosophical mind has come across: eat to live or live to eat. I think have to do both: we eat to survive, but also eat to enjoy the whole experience of cooking and dining. Every now and then we may need to eat bland food but put a bit more heart and time to make a better dish or go out and find a nice dish to eat. Times do change and some of us do look at counting calories or chasing that taste to taste when it comes to eating. Being too obsessive over either isn’t all that great. At times we might be busy and be lazy and so takeaway and fast foods might be all we eat. Like you said so aptly, eating becomes a mechanical process. While this kind of eating may taste good, we might not feel too good after eating or in the long run. That’s why it’s so important to be very much aware of what we eat and put time into eating and eating for ourselves and share that with the world. I am sure the Thali there will be tailored, much scaled down version of what is available in India and you will perhaps get a slight ting of the real spice…and indeed our taste buds get suited to certain type of food and anything extreme of the spectrum we feel the heat. So well said Food is the spice of life. Perhaps we can compare it the way we look at life as a journey or get tied to the destination then we miss the joy of life, so is the case with food, we should enjoy the very process of cooking and eating, not just the food for living. The mix and match of food is so essential to our body need and also giving our taste buds a variety that they so much love. Busy and Lazy, good one…and we rely on the fast food and the taste and the easiness, makes us dependent…anything stretching our dependency is not healthy and food is no exception. Doing a little work on what we eat and how food can change our mood, and then we have so many things to do when we are joyful and enjoy life with all its flavours. Thanks as always Mabel and have a lovely weekend. Here in Australia food is definitely no where near as spicy as in Asia…even many spicy Chinese dishes here are mild. So many I should start by eating Thali here in Melbourne lol. ‘stretching our dependency is not healthy’ Wise words. Like everything, food needs to be eaten in moderation, because that can control our mood and how we feel physically and emotionally too. I love eating with chopsticks. I even have my own set that I can bring if I’m going out. I liked reading about the differences between Western and Easter cuisine here, Mabel! I like that many Asian meals are meant to be shared as I feel sense of belonging with my table when when this happens at a restaurant. I agree though it’s easier to figure out the bill when you have a meal to yourself in Western style 😉 Great writing, dear friend. I prefer Eastern meals now, especially living in SF where there are wonderful options. Your posts always get your readers thinking. I definitely prefer Asian cuisine although I am getting used to food here in the US and liking them, too. I miss going in restaurants back in the Philippines (Filipino or Chinese) and having everybody order food to share. I like the rice and the meat and vegetables that go with it. I like the atmosphere – the clatter of utensils and the chatter. Interesting post, Mabel. My husband and I rarely go out to eat so can’t compare from that angle. Bob and I enjoy cooking at home, and we make both Asian and Western. We have no favorite. When I first met Bob, it surprised me to see a pair of chopsticks in the utensil drawer. Yes, we both enjoy cooking and eating a wide variety of foods. I hadn’t heard that upside down spoons invite evil spirits, Mabel. I always leave them upside down on the draining board after washing up as they drain better. Does that count, or only whilst dining? 🙂 🙂 Hope life is going well for you. Mabel I had been waiting for a food post as you have had s may mouth watering images on Instagram. Here I am, albeit late to the table. It is one of my biggest fears when we travel to foreign countries that I will do something at a meal that will insult the local people. I’m not a very adventurous eater which likely means I miss out on a lot of incredible culinary treats. Perhaps it is a bit odd as I love adventure in so many other areas of my life. At any rate it is most interesting to see the differences as you have explained them so well. Have I mentioned I am useless with chopsticks. I likely need a lesson from you. Interesting as usual, Mabel! I like both western and Asian food. I just like food. And, food is a great part of tasting a new country – isn’t it? I use chopsticks quite easily because of our many travels to that part of the world. My daughter’s friends include a whole Asian family, so I have to handle chopsticks. My thoughts are the same as yours, I guess, about why we like some food better than other options. But I think…In Sweden we eat lunch at school, and I guess this has a great impact on our future choices. School food changed from man made to industrially made and processed food – and then back to more of man made again. During my school food years, I had rather some dishes destroyed for many years ahead. No taste, watery, over cooked, fat food etc. As a grown up, I have been cooking for so many years, that almost all of those “lost” dishes now are restored to their reasonable glory. In my heart, I treasure the food I ate as a child, at home, in my mother’s and grandmother’s kitchen. I still make those dishes, but add spices like chili and garlic and other combos of stronger alternatives. In the old days, people up north tended to have less spicy dishes, but that has changed in Sweden, since long – spicy is the thing. A gift to us from other cultures, through travels and immigrants who taught us. ‘eating food is a great part of tasting a new country’ Really like how you say it, Leya. Some dishes can only be found in certain parts of the world, and some dishes can only taste as they are in a certain part of the world too. It sounds like your kids eat widely and are very open to eating different kinds of foods. As someone raised 90% on Chinese cuisine at home here in Canada until I left home in my early 20’s, there are some practices that do vary with each Chinese family living in different countries and their socio-economic class. We never ate at a round table at home….no room to put a round table for a family of 8 people. I also learned and used chopsticks since I started to eat as a young child, same for all my siblings. Use of spoon and fork was learned around the same time also. People in my family don’t necessarily divorce use of chopsticks exclusively for Asian foods. If there’s bite sized food in a Western dish, then chopsticks might be used as a matter of convenience. I’m not certain if my family representative..but meals can be quite fusion. A Chinese dish, with raw salad on the side. Or whatever. It can be melange of cultural cuisines in 1 meal. I agree about the balance of contrasting flavours in 1 meal, also fruit instead of baked dessert to finish a dinner. Right now we’re at the tail end of our Asian trip –Japan and Seoul, South Korea. So personally, I’ve found it interesting…in differences with Chinese cuisine. Yea, later a blog post or so….soon. It is interesting to hear that your family didn’t eat at a round table growing up. But because that was due to a lack of space, it’s practical. No reason why you can’t use chopsticks to eat Western food. Sometimes I like to use chopsticks to eat pasta I cooked at home. As you said, choice of utensils can be a matter of convenience. It sounds like you eat widely and don’t mind eating fusion. Growing up my parents weren’t big fans of that and were and still are very into traditional cooking and eating. My mum in particular isn’t a huge fan of salads and was always insistent that the kids eat meat. My mother did whatever dishes were convenient for her…which was naturally Chinese. However she did experiment with some dishes which became uniquely her own /family favourites. My mother would have us prepare the salads, etc. or whatever if she couldn’t do it. Now family get-together potlucks are total mix-up of both Chinese and Western dishes. It’s gonna take awhile for me to offload my many photos at home first..
You bring up an insightful point. Our parents probably prepared dishes out of convenience, and the dishes they knew how to cook. We all got to eat, someone’s got to cook. Interesting details here, Mabel. Then those mouthwatering images 🙂 I have eaten with chopsticks only once – when I was in Amsterdam and did a terrible job with it. When I visit Chinese/Japanese restaurants here in the US, I use a fork although the cuisines are traditionally eaten using chopsticks. When I’m really hungry I use hands – very Indian way. Cold sandwich was something I was never used to (since it was never the norm in India), but now I like it or rather was forced to like it in the west. “Sometimes we eat the foods we’ve always eaten to really be who we are” – you’re spot on – and how satisfying that experience is. Excellent and mouthwatering post Mabel 🙂 I don’t have a food preference – wherever I am, Im happy to try the food provided. The only meat I eat is fish – no religious reason, purely taste. I haven.t eaten ‘meat’ for around 20 years. I love tofu as much as I love potato, as much as I love noodles and rice. I do like bread though and have been known to get strange looks when I ask for a bread roll to wipe my plate clean in a Chinese restaurant :D. I am happy eating cold foods as well as hot and I don’t think there is a dessert I don’t like 🙂 Maybe my taste is due to living in England, Singapore and Australia? Take care Mabel and stay warm. Sounds like you are not too fussed with food apart from most meats. Tofu is amazing, whether steamed or fried, and Singapore hawker centres cook tofu so well. And jook/porride, Chinese doughnuts and dim sum and more… Haha, I would stare at you too if you wiped your plate clean with a bread roll in a Chinese restaurant. But I guess that is your way to show appreciation you enjoy what you are eating. Hi M – nice Bourdain quote – and just curious as to if you wrote this before or after Bourdain died – ?? Wrote this piece after Bourdain passed on. Somehow it felt fitting to include one of his notable sayings in this piece about foo around the world. O much to think about here – and I like when you make lists like this – so easy to follow and you really put some thought into what and how info is shared – and that is nice as a reader. We had Korean food in DC and it was BRIGHT lights all the way – and so good. and how it brings a connection. It ties into what I have read about yoga and at times we hook our large toes to close the circuit and connect our body energy. oh that is so true about the energy we bring into our own field – and it is so interesting to learn more about this. Food is energy and so are we. When we touch out of kindness and generosity, we spread a special kind of feeling. Mabel, a brilliant and learned article – it is fascinating to read and your personal experience and angle to the post makes the topic even more interesting. I do like the idea of sharing food in eastern eating, giving you the chance to try new foods, to pick and mix! Understandably round tables helps a lot in this process and takes away the dilema who should sit at the top of the table – often the place where people feel most left out! Thanks, Annika. That is exactly right when it comes to sharing food, pick and mix! A nice opportunity to try different foods. When you share food with others, it brings you closer to them: you eat what they eat, and there’s a chance to get to know each other all the more. It is something special.